Artist Henry Kidd from Colonial Heights, Virginia has made a pledge to visit every Police and Fire Department in NY and Virginia to give them a copy of his painting honoring the Fire, Police, and the victims of the 911 terrorist attacks. 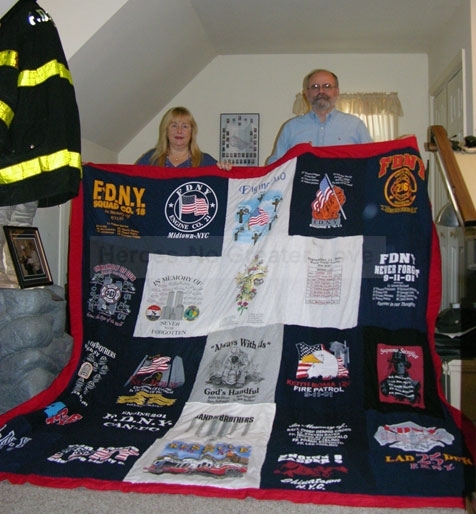 This quilt is made of tee shirts from many of the Fire Stations Mr. Kidd visited while carrying out his "adopt a station" program. The center forms a cross. Each of the individual shirts are put together in such a fashion that none have been cut so that they can be preserved for history.